Captivating, compelling, and tense, this production remains faithful to the tone and message of Reginald Rose’s 1954 television movie, while adding more nuanced layers through directors’ adaptations. Ultimately, the dynamic relationships within the ensemble of characters, the involved guidance of the directors, and the attention to detail of the crew let Rose’s timely and timeless story shine through. In this play, anonymous jurors in a murder trial must compromise in order to determine whether the given evidence requires them to acquit the young suspect or condemn him to the death penalty. What follows illustrates how ugly, yet deeply necessary, compromise is, especially in a democracy. One of the most challenging aspects of this play is that the titular jurors are onstage for nearly the entire show, but not all are always the main focus. Although many cast members did not have speaking lines for extended amounts of time, the entirety of the cast remained engaged and present for the duration of the play. Stand-outs include Jon Garcia (‘20) as the aged Juror 9, Allison Furlong (‘20) as the dogged and irritable Juror 3, Josh Scott (‘19) as the irreverent Juror 7, Ghina Fawaz (‘22) as the wise Juror 11, and Faith Artis (‘21) as the softly powerful Juror 5. Garcia’s immersion into his grandfatherly character was consistent in posture, gait, and voice. Meanwhile, Furlong kept her longer lines from falling flat by varying her body language and tone in a way that felt natural for the character. Scott’s character is written to be unlikable, but his dynamic performance proved that he does not have to be likable to be compelling and enjoyable. Fawaz delivered a well-rounded performance that showed her character develop like a well-executed crescendo, topped off by her consistent accent. Artis was keenly aware of how her energy affects the scene and uses it to her advantage. 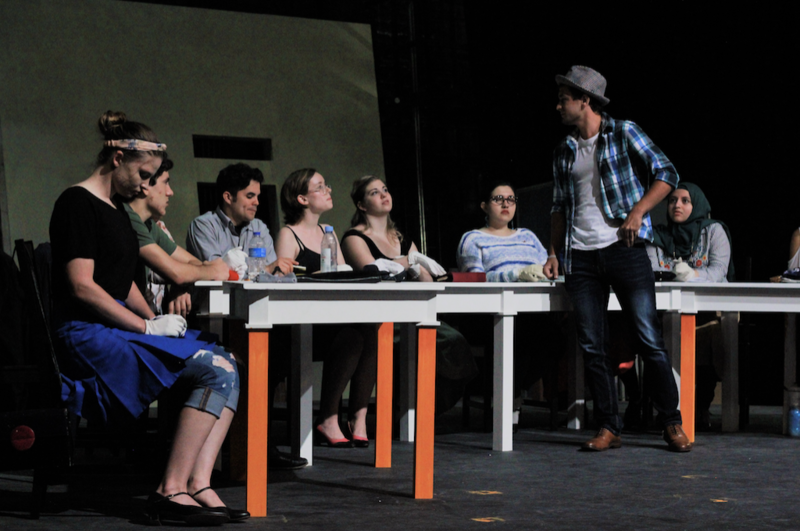 Director Thomas Oullette and Assistant Director Fiona Campbell (‘19) adapted the 1954 screenplay to best fit their cast and stage. It is in the adaptation that the Annie Russell Theatre’s personality shines through. Traditionally an eastern European character, Juror 11 is Middle-Eastern in this version. The lines that were changed because of this are seamless within the context of the production. While some lines said by the women on stage did not feel fully adapted to the feminine roles, the direction and blocking flowed in tandem with the narrative. In a play that is essentially one long scene, it is difficult for a technical crew to stand out. However, the astounding attention to detail from the costumes, set, props, and stage management departments brought the play to new heights. From a working clock that serves as a tool in the story, to artificial sweat-stains to show passage of time, to old-age makeup visible in detail from the back of the theatre, the technical design and execution was outstanding. Furthermore, with so many sound and light cues, including dimming daylight, music cues, and thunderclaps, electrics and stage management had their work cut out for them. However, their hard work paid off with a flowing final product. The hard work that the cast, crew, and directors put into their three weeks of rehearsal was made obvious from the moment the lights slammed off at the sound of a gavel. By letting the text and personality of the Annie Russell shine in the spotlight, “Twelve Angry Jurors” was able to be memorable and impactful. Friday, Oct. 5 at 8 p.m.
Saturday, Oct. 6 at 2 p.m. and 8 p.m.